The HTML5 Filesystem API is a versatile API that addresses many of the uses cases that the other offline APIs don’t. It can remedy their shortcomings, like making it difficult to dynamically caching a page. I’m looking at you AppCache! My ♥ for the API is deep–so much so that I wrote a book and released a library called filer.js to help promote its adoption. While filer aims to make the API more consumable, it fails to address the elephant in the room: browser support. 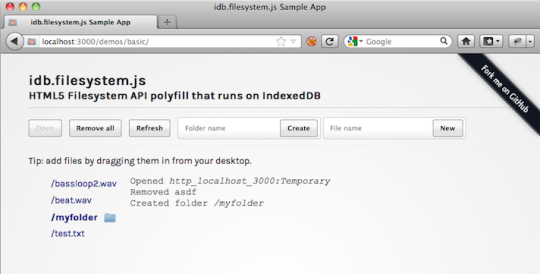 Today, I’m happy to bring the HTML5 Filesystem API to more browsers by releasing idb.filesystem.js. What’s exciting is that both of these apps work in FF, Chrome, and presumably other browsers that implement storing binary data in IndexedDB.